Chanting the Names of Manjushri (Skt. Mañjuśrīnāmasaṃgīti; Tib. འཇམ་དཔལ་མཚན་བརྗོད་, Wyl. ‘jam dpal mtshan brjod) (Toh. 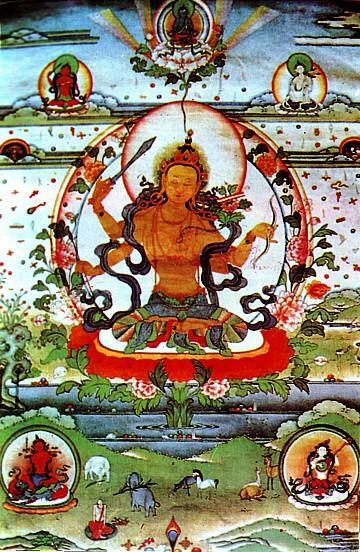 360) — a famous praise of Manjushri, sometimes known as the 'king of all tantras'. The essence of this praise is that Manjushri bodhisattva is the embodiment of all knowledge. It consists of 160 verses and mantra sentences. In spite of the text's length and difficulty, Jamyang Khyentse Chökyi Lodrö famously memorized it after reading it only once. Tulku Sherdor, Professing the Qualities of Manjushri, in The Wisdom of Manjushri. Blazing Wisdom Publications, 2012. This page was last edited on 21 November 2018, at 22:52.